The Birdseye Maple in the body of this custom jewelry box has a beautiful grain pattern and vibrant colours. Purpleheart edges provide a great accent. The scene in the centre of the top is bordered with bands of Birdseye Maple and Purpleheart which are separated and defined by black veneer edges. 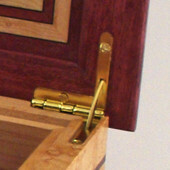 The drawer sides and dividers in the interior are made from solid Maple. 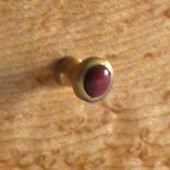 Solid brass drawer pulls with Purpleheart inserts. Drawer sides, trays and dividers are solid Maple. Interior is lined with a luxurious burgundy faux suede.